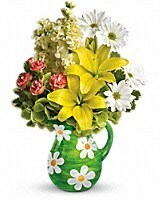 Teleflora's Pitcher of Spring Bouquet in California MO - The Flower Shop For All Occasions, Inc. The Flower Shop For All Occasions, Inc. Flowers will always be one of the most beautiful gifts you can give. Arranged in a charming pitcher decorated with hand-painted daisies, they're more than beautiful. They're BEAUTIFUL!!! Share their beauty with someone special. 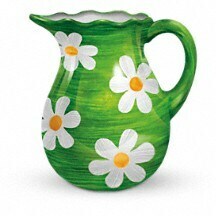 Make spring springier with fresh flowers in a lovely hand-painted pitcher covered with daisies that bloom forever. So much beauty for such a reasonable price. Boost the spirits of several friends - and yourself as well. 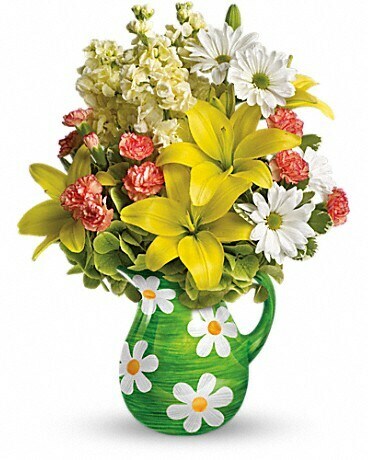 The delightful little ceramic pitcher graced with hand-painted daisies is another exclusive creation from Teleflora's Flowers-in-a-Gift collection. Perfect for flowers, juices, milk - or displayed alone.